Is Rob Portman Still Underperforming vis-à-vis Trump in Ohio? As Republicans attempt to minimize losses in U.S. Senate elections next month, one top Democratic target has seemingly emerged out of the danger zone over the last several weeks and appears headed for a comfortable GOP reelection victory. First-term Senator Rob Portman has seen a large uptick in his lead over former Governor Ted Strickland according to public opinion polls released over the last month. 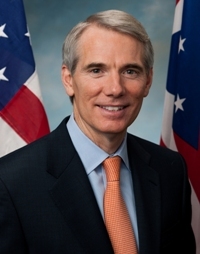 Portman has led Strickland by double-digits in nine of 11 surveys conducted since September – having trailed the Democrat in a majority of polls released in 2015 through the early summer of this year. Portman’s large lead may be due in part because the “Trump drag” has not exactly materialized in the Buckeye State. Donald Trump has been performing better in the Buckeye State relative to most 2016 battlegrounds across the country. Senator Portman is currently running 5.4 points ahead of his party’s presidential nominee according to polling averages via Real Clear Politics. Portman’s support among likely Ohio voters is averaging 48.6 percent while Trump is at 43.2 percent. While that sounds good for the incumbent, the margin between the two Republicans in Ohio is more compressed than most general election results over the last four decades. [Not to mention the fact that Trump’s support (as well as Clinton’s) is lowered by a few points owing to Gary Johnson’s candidacy]. Of course, support for Carter and Clinton was depressed in part due to the notable independent candidacies of John Anderson and Ross Perot respectively, though not enough to account for the entirety of the gaps in candidate support listed above. Prior to 1980, it was unusual to see these large gaps between the winning Ohio U.S. Senator and his party’s standard bearer at the top of the ticket. The only winning Ohio U.S. Senate candidate who ran at least 10 points ahead of their party’s presidential nominee prior to 1980 was Democratic Governor Frank Lausche in 1956. Lausche won his senate race against incumbent George Bender with 52.9 percent – 14 points ahead of Adlai Stevenson’s 38.9 percent in the state. Given his large lead over Strickland, it seems Portman has enough play in his electoral rope to retain his seat even if Trump slides and ends up losing Ohio to Hillary Clinton. Such split-ticket voting would be unusual, though not unprecedented, in the state. 1988: Democrat Howard Metzenbaum won his third term while George H.W. Bush defeated Michael Dukakis by 10.9 points. Only a dozen states have split their vote between these two offices at a lower rate than Ohio’s 22.2 percent: Arizona, Connecticut, Illinois, Indiana, Kansas, Michigan, North Carolina, Oklahoma, Texas, Utah, Wisconsin, and Wyoming. 3 Comments on "Is Rob Portman Still Underperforming vis-à-vis Trump in Ohio?" 1. Who is “Rod” (or Rodney, or variation thereof) Strickland? 2. a) Actually, it is the donald who arguably may be overperforming via-a-vis Portman, given the emphatic absence of support from Governor Kasich and the official state party establishment; b) This cycle might turn out to mark a new watershed – transitioning from a competitive two-party state (though at both presidential and gubernatorial levels, it was always marginally more R than the nation as a whole) to that of a one-party stronghold (with perennial opposition enclaves in Columbus, Cleveland, Toledo, and Athens). Alas, Rod Strickland is a former NBA basketball player (1988-2005) who it would appear fell well short of ever winning the governorship of Ohio! WTHey, Rodney S even lacked any association with the “Cavs” – let alone any OH political party or its state government (SMH, then LOL).